Following Philip Seymour Hoffman’s tragic death earlier this year, Robin Williams’s sudden departure this week caused great grief among his millions of fans around the world. Both Hoffman and Williams were immensely talented actors who suffered from depression and addiction. They eventually surrendered to the destructive forces that had apparently tainted their much celebrated lives. I was much too sad to write about Philip Seymour Hoffman. When I watched ‘The Master’ I had sensed that beneath his enormous talent a dark sorrow was brewing. When I found out about his death, I had the sensation that he slipped through my fingers, as if I was holding him just above the water by having acknowledged his pain. Robin Williams’s apparent suicide is perceived as another thing entirely. There seems to be a lot of negativity around Williams’s passing, simply because he intended to take his own life. The media is ruminating about all that was going for him and how selfish it was of him to take his own life. What is it about people that makes them think the more you have the better your life must be? Isn’t it much more likely to suffocate because of all that you do have? Depression must be even darker and uglier if the sufferer is perceived as undeserving of that suffering. Imagine suffering from a disease that you don’t even have a right to have. Imagine everyone around you dismissing your debilitating state of mind. Imagine you can’t even be at home with your own pain. I don’t see much difference in how death came to both these actors. More important question is, surely, why they welcomed it in the way that they did. Both Hoffman and Williams’s passing should bring into question why such fortunate and supremely gifted people lived so close to the edge. Why were they so unhappy? And why do we react with bitterness and criticism to such loss? 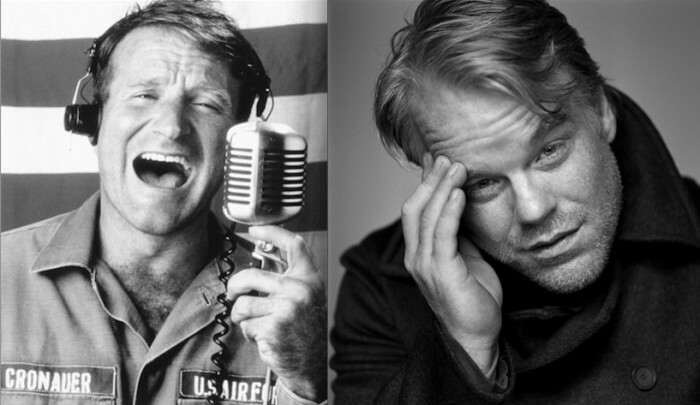 Robin Williams was a beautiful soul, as was Philip Seymour Hoffman. While I don’t mean to compare their lives and deaths, I salute them both together as two heroes who lost the same battle. I don’t know the particulars of their depression, but I appreciate their suffering. Their gifts are irreplaceable. Our loss is great.